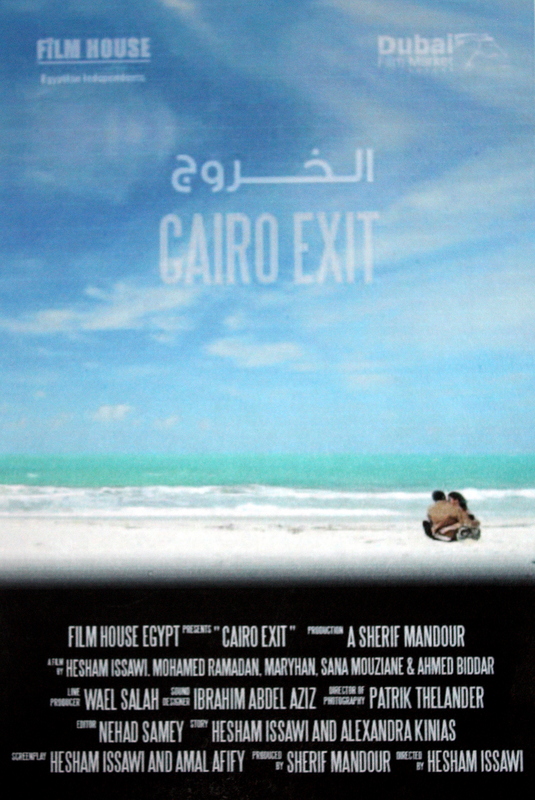 The story of Cairo Exit takes place in a small town in the outskirts of Cairo, Dar El Salaam, a city that inhabits mostly lower class, working class Egyptians. In the ancient time until the 60s this was the most fertile land but now it’s slums inhabitant by all kind of people, workers, teachers, drug dealers…etc. The town is close to Maddi an upper class neighborhood and the local calls “the American Neignobourhood.” The Nile runs through it. The city is one of the many slums that surround Cairo. In twenty minutes a person can leave old Cairo, the slums of Cairo that look like a medieval places to Zamalak or Maddi with their westernized hotels, houses and internet cafes. It’s precisely the journey of the main Character, Amal, through Cairo from the slums, to modern Cairo, to Coptic and Islamic Cairo. This journey in the bewildering chaos of the city, the visual turmoil and disorder of color is all part of the frame in Cairo Exit. In this story everyone wants to leave and everyone has a secret of his or her own. Cairo is a city of layers, ancient civilizations crumbled over each other, covered by modern way of life. The challenge is to capture the light and dark contrasts of the city with fresh eyes— to create a visceral, immediate experience for audiences, immersing them in the sweltering heat and small alleyways. Since we’re shooting in the heart of the city’s infamous but rarely explored slums, capturing their energy and urgency on-the-fly, with an unforced realism. By using a hand-held camera to reflect the urgency of the city, the disorder of details and to activate the perception of loneliness for the characters. With a distilled narrative and a closely attentive camera, the story offer up characters, often members of what might be called the struggling classes, who are humanized through their daily choices. Though the film is scrupulously naturalistic, in lighting, camera work, sound design, still somehow it belongs to the suspense genre, though it is suspense of character, not of plot. It is not so much a question of what will happen next, as of how the characters arrive, or fail to arrive, at a decision to act. The Camera and the natural lighting will capture the rhythms of life and the raw reality of the streets. Using caressing natural light, early morning breath, orange tone for the city, dusty green for the in doors locations like the house of Amal. Earthy colors from most of the characters and capturing the neon blue, red and green lights that sweep Cairo at night. The whole film is a constant discovery, each new image striking our eye in a fresh way; the impression unfolds before us. Another key feature is the moving between indoors and out doors location, completely objective, where the camera just happened to be. The main character and the main focal of the story is Amal Iskander a poor 18-year-old Coptic Egyptian girl. Her Muslim boyfriend Tarek is planning to leave Egypt on an illegal boat-crossing to Italy. Amal tells Tarek she is pregnant but he gives her an ultimatum – abandon the country with him, or have an abortion. Amal, who loves Tarek and wants the baby, rejects both choices. But when the battered scooter she uses for food deliveries is stolen. Amal is fired from her job and suddenly finds herself with even fewer options. Her future, limited from the start, looks even more uncertain. In the poor neighborhood of Bashtel where Amal lives with her mother and a stepfather who is a compulsive gambler, day-to-day existence is difficult for everyone. Her sister, Hanan, is also an unwed mother with few paths to a better life. Her best friend, Rania, is trying to raise money for an operation that will disguise the fact that she is no longer a virgin so that she can marry an wealthy, older man whom she does not love. Amal seeks guidance in prayers to the Virgin Mary, but with few real possibilities left, she takes the only job she can find – in a hairdresser with low pay. The new job opens up the underworld life within Cairo that Amal never imagined – a life of luxury, leisure, expensive homes and cars – but also one of vice. At one of her destinations, a high class brothel in an exclusive part of town, she discovers her sister Hanan working as a prostitute in order to support her child. Devastated, disgusted by the life of the underworld, she gives up her only possibility for self-sufficiency. Neither desiring a loveless marriage like Rania’s, nor wishing to end up destitute like her mother and sister, Amal decides that she must abandon her family and their difficult existence in Egypt to join the man she loves and take the risky journey across the sea to another life. A raw, slice-of-life portrait of the Cairo streets and the true lives of its struggling class, “Cairo Exit” is director Hesham Issawi’s view to the hardscrabble lives of the working people of the country of his birth.